Ben, the adorable panda cow baby you see in the picture above, is a very rare creature indeed. As a panda cow, due to his rare coloration, Ben the panda cow is only one of about 24 panda cows living in the world right now. The reason panda cows are so rare is because they are the result of genetic manipulation on the part of farmers attempting to produce a cow with the same coloration and pattern as a rare Chinese panda. This makes baby Ben one of the rarest and cutest little mini-cows in the world. Ben was born on Chris Jessen’s Larimer County farm, near Campion, Colorado. Ben’s mother is a Lowline Angus; his father is a panda bull. 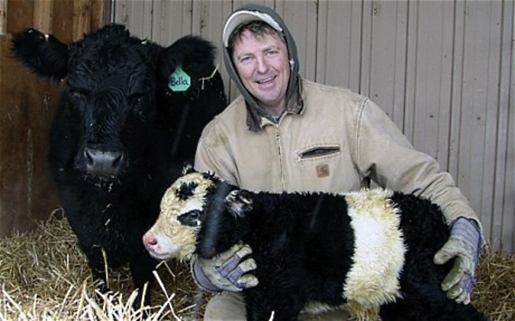 Chris raises and sells miniature cows to serve as family pets. Given Ben’s rare coloration, he is expected to sell for up to $30,000, assuming Chris wants to get rid of his main tourist attraction. If you had one of the rarest cows in the world, would you be rid of him? I sure wouldn’t! This is a genetic goldmine just waiting to be bred with all the other miniature cows on the farm! You can corner the market on cows that look like pandas!